Nick Elmore (Multihull with Asymetric), Roger Pimm (Multihull without Asymetric), Mark Dell (Monohull PY under 945) and Spratty (Sandhopper). Although there is no category of outright winner, Nick Elmore was the fastest on corrected time. Well done to all of you who competed in Sundays Nore, a special well done to John Glynn who this year competed in his 30th Nore race. Please either go to youtube.com and type “pico nationals 2008” into the search box or click on the link below and you should find 25 short videos that I took during Saturday’s racing. The videos are in sequence, so the best place to start is shot 1. This coming Saturday Cadet Club is at 6.30 p.m. If you are a new member and need help with boat rigging, using the club boats or would like your children to get out on the water then there will be a group of cadet parents on the beach to help. Pico Nationals – The Echo are planning to run a race report and pictures from last weekend in Friday’s paper. Lets see who the lucky ones are with their photo’s in it. This Sunday the 29th June 2008 is Benfleet Yacht Club’s Nore Race. Please click on the photo right for more details and entry forms. Please click on the picture on the right to find a very useful animated site on knot tying. Pico Nationals 2008 Thorpe Bay Yacht Club. 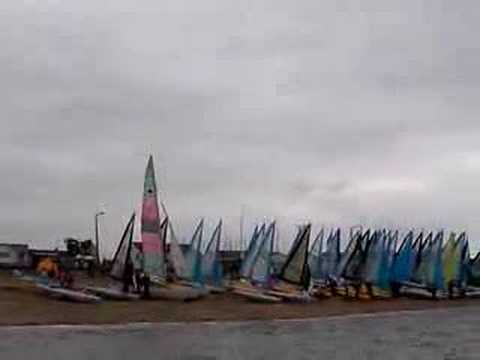 Thorpe Bay Yacht Club hosted the 2008 Laser Pico Nationals over the weekend of 21st and 22nd June with varied conditions for the 46 entrants from around the UK with an age range of 7 – 54. The event attracted sponsors from The Laser Centre, Wet Suit Outlet, Yachts & Yachting and Henry Lloyd. This is the third year the Pico Nationals have been hosted (2007 Gurnard) and already the fleet turnouts are exceeding all expectations for this amazingly versatile dinghy equally suitable for children and adults. This year the Nationals were sailed as a single fleet with handicapping for different sail and crew arrangements. Fresh winds and a lumpy sea greeted the starters for this year’s Championships and although the conditions were not idyllic – there was an abundance of enthusiasm and competitiveness from the younger crews.Three races were scheduled for each day in the broad uncluttered expanse of the Thames Estuary overseen by professional race officer Alan Willis and equally supported by Sally, Linda and Lisa. Race 1 started cleanly in a steady force 4 on the flood tide. James French (Gurnard) made a clean break from the pack and was first round the top mark followed by Dan Henderson with new crew Max Duce (TBYC), then Natalya Eyre and Ben Warrington (TBYC) and Alex Farrell (TBYC). After much jostling with the top four James French pulled back into the lead to take the win by 16 seconds on this traditional triangle sausage course. Race 2 saw the bulk of the fleet right on the line at the start with 2 crews being OCS and pulled back by the race officers. Racing was tight all the way to the top mark with few rule infringements. James French had a comfortable lead on the top mark from Mark Harrison, Andrew Paterson, Natalya Eyre and Dan Henderson when James capsized on to the mark whilst bearing away. Despite a rapid recovery and taking a penalty turn, James was overhauled by the top pack on the reach to the gybe mark. On the next upwind leg and with a freshening breeze, Dan Henderson changed up a gear, got into his stride and pulled into the lead to take the gun by 14 seconds from Andrew Paterson. Race 3 with the Thames Spring Ebb in full flow saw some interesting tactical changes on the start. To start at the committee boat end or the pin down tide was the question. The fleet was divided as this is where all up weight became critical on the Pico with the heavier crews opting for the up tide end and tacking straight off onto port. The lighter crews on the pin made excellent progress to reach the top mark in a tight bunch with the opposing group. 10 boats rounded in quick succession led by James, Dan, Andrew and Natalya. Shifting wind saw the top 5 fighting all the way down wind to the leeward mark with Dan inches behind James at the turn. On the final beat to the finish Dan and Max took the win by 2 seconds on corrected time from James. The overnight positions gave Dan and Max a 2,1,1, with James 1,4,2, so all to play for on Sunday. Sunday with 3 races scheduled – bright, sunny and a constant 30mph on the TBYC on line weather station gave Alan Willis no choice but to cancel the second day racing much to the relief of the competitors and safety boat crews. Dan Henderson and Max Duce were crowned as the Pico 2008 National Champions, with James French runner up followed by Natalya Eyre / Ben Warrington in third, Ben Green in fourth and Mark Harrison who scored a consistent 5,5,5 in fifth. The Wight Cable Cadet Cup (first under 15) was won by James French and the Designers Cup was won by Peter and Rupert Snow. The Isle of Wight Trophy for first youngest with a combined age of 18 was won by Finlay Cullender and Alex Thomason. Generous equipment prizes were awarded to the top 8 by Wet Suit Outlet, Henry Lloyd and Laser performance. Prize giving culminated with Simon Ogden from Laser Performance pulling out the winning raffle ticket and presenting a brand new race sport Pico to an amazed Tom Harrison. The weekend again proved the Pico to be an exceptional racing boat – great for learning tactics and capable of being raced in varied wind strengths by light and heavy weight crews for competitive racing. A fantastic time was had by all on and off the water. The Pico class are a very friendly bunch – noted by not a single protest being made for infringements which made the protest committee redundant. Our thanks to Shaun Christian for his fantastic skills in organising and running the Nationals. Thorpe Bay Yacht Club which excels at hosting these events, the race officers and spotters, Tony Clarke and his support crews, Howard Hawkes for acting as beach master, our sponsors and never forgetting of course the cadet mums for supplying us with home made cakes and hot chocolate. Please call the club on 587563 or Dan’s Mobile 07949980763 to book. Dodgy lighting and weird music should set the atmosphere. Dining from 7:30pm-9:30pm (when the sailing finishes). Please click on the image on the right or look in the Photo Gallery situated to the left of this article to see some photos taken by Nigel Campling during Saturdays racing. PS. If anyone has any more please either get them to me via email or cd. Duty swap required for Saturday 5th july. I am planning on going to Stone Hurricane open meeting on this particular weekend followed by the east coast piers race on the next and would be available for dates from 26th July.